The Dynacraft Surge is the latest smart wheel wonder for the kids in the age group of eight years and above. It’s a cheap off road electric skateboard and runs at a maximum speed of 6mph and a range of 5 miles. It can carry a payload of 145Lbs at three distinct speed levels. The deck is designed with maple wood and aluminum alloy frame. The exclusive onboard grip tape provides maximum safety while riding at top speed. Additional features are the foam pad for pressure absorption, battery retainer for power conservation, and an attractive deck design. The rear side motor generates a power of 150 watts by taking an input of 2V DC supply from the battery. The next step for you could be the Acton Blink Board once you master the basics with the Dynamic Surge. Onboard Battery: The onboard twin battery (12V, 4.5AH) assembly is located at the center of the rear board. It is directly connected to the single power packed motor assembly with the help of onboard power cables. The twin battery retainers onboard provide a tight connection between the motor and the battery assembly. The pressure contact points are designed to prevent any power loss during transmission. They also provide high resistance to shocks and vibrations during your travel on terrains and slopes. The waterproof battery box provides protection from moisture, water, heat and humidity. 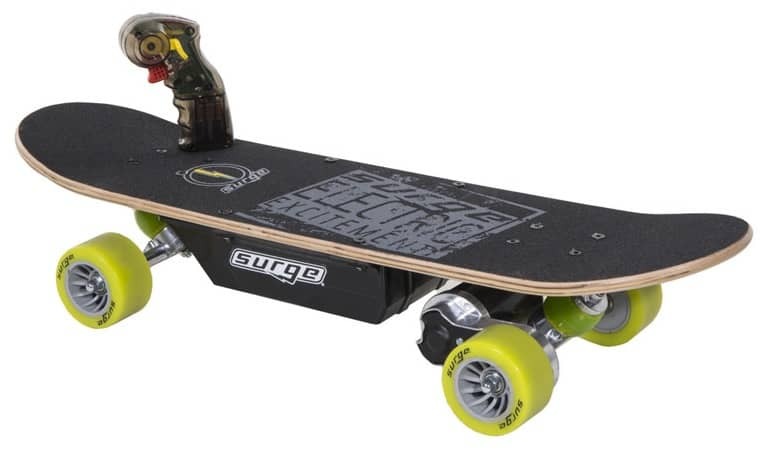 Skateboard Motor: The motor assembly of the Dynamic Surge consists of the core, belt, casing, enclosing cover, truck fixer, and a remote sensor. The composite material belt is built for strength and top resistance to wear and tear. Since the belt connects directly to the power wheel, the transmission of the torque from the motor core onto the wheels is always the maximum. You can control the speed of belt rotation with the help of 3-speed level remote through the onboard sensor. The motor is designed to provide the torque on demand to the rear wheel assembly. It means the assembly draws only the required volume of power from the battery as you increase the acceleration with the remote. Hence, the board can conserve the battery energy and prolong its lifetime. Skateboard Truck: The skateboard truck assembly is made of a strong base plate, kingpin, hanger assembly, axle, and bushing. It can withstand high pressure from the rider weight, friction from the wheel assembly, and the drag experienced by the board while moving on road. The hanger width of the truck is designed to distribute the vertical weight along the width uniformly. Since the metallic truck absorbs most of the stress, you can experience shockproof ride at top speed. The base plate of the truck is situated at an angle from the bushing seat to provide the most optimum height to the board deck from the ground level. The pivot point in the truck hanger at the rear and front trucks help in directing the board movement. You can move the board in forward, reverse and angular directions with ease. The kingpin nut is designed to simplify the board turning to the left and right without disturbing the center of gravity and your body balance. The other best aspect of the Dynamic Surge truck is the construction of the base plate. It can use the reverse kingpin design to turn the entire board at acute angles (right and left) up to 90-degrees. The axial rotation of the wheels and their speed are efficiently controlled by the truck on all types of terrains. Skateboard Deck: The skateboard deck is made of maple wood. The dimension of 8.46” X 12.4” X 33.27” provides maximum width and length for you to balance your body and attain a stable posture. The contours at the front and rear wheels are provided to attain optimum speed. The deck height from the ground level is 11”. This height and the width between the twin wheels (right and left) are sufficient to keep you safe from any dynamic vibrations generated from the wheels. Skateboard Wheels: The drive wheel is the key component that provides torque, speed, and acceleration to the Dynamic Surge skateboard. The connectivity with the drive belt is the most critical factor that determines the torsion and tension factors. The drive wheel is designed to hold onto the motor securely through the belt. The bolts on the belt casing and the axle lock nut provide maximum stability to the wheel assembly. The inner parts of the wheel bearings are constructed to absorb maximum shocks while rotating at high speed and traveling on rugged terrains. The wheel connectivity to the belt-drive ensure free rotation at optimum RPM. You can also read the review on the Yuneec E-GO 2. The functional specifications of the Dynamic Surge ensure maximum safety for you. This is achieved by streamlining the time interval between two acceleration points. The remote control and the sensor onboard ensure smooth variations in speed without making you lose your balance. Auto Shutoff: If you keep the board and the remote idle for five minutes, they automatically shut down to conserve the battery power. Remote Function: The remote control has sensors to warn you about low battery, dead battery, and other potential risks while traveling. The frequency between the onboard sensor and the remote is streamlined to provide maximum control over the board. You can accelerate and decelerate at your convenience. Make sure you change the speed at regular frequency to avoid accidental falls. For this you need to get trained in handling of the remote in an efficient manner. Best skateboard features for kids beginning to learn the basics. Safe speed limits and extended range. Maximum protection for the rider with steel and maple wood fusion board assembly. The charging time of the board battery is too high (12 hours as stated). The Dynamic Surge is the most recommended skateboard for the kids beginning with the basics. You can safely take it to your school, picnic, and any outdoor spots with ease. Read the review on the Acton Blink S to learn about the advanced skateboard after training.